I learned about Drift from several companies with whom I do business. It is an incredible tool to help me warm right up to people coming to my site needing help. The only thing I did not like about it is the blinking of message notification on my browser tab but actually what can be done is simply click on that and it goes away. It is a bit expensive but people have the ability to book right there in the chat. Being able to start the conversation without feeling weird and creepy. Drift is relatively new to our tech stack. We’ve been able to implement it with a few clients (as well as ourselves), who use it to amplify their sales process. Drift has been very convenient and has cut communication time in half. It’s pretty simple to program a workflow for your sales reps to work through when communicating with a lead. Customer service has also been great. The dashboard layout was a bit tricky for me at first. Once I got the hang of where certain pieces were located it wasn’t that bad, but there was a lot of digging around that needed to be done at first. First of all, I see a product that makes you feel great and ready. I really like chatbot (I haven’t used it yet but will use it soon). You can collect data with a chatbot without forms. That’s great! I don’t know any cons side of the product yet. Drift is the world’s first and only conversational marketing platform. You can talk to your best leads real time on your page and create super personalized messages to get in contact with them. But honestly, I can’t really mention anything bad. The team shifts monthly new features. They are super fast! I love that I am notified instantly to my phone so I can respond and know when people are looking at our site. Responding fast is key to try and answer any questions they have and close the sale. ConsSometimes it does not reveal the customer’s name right away. But this is not a big problem, I believe it does once I enter the chat. Founded in 2014, Drift offers one of the leading conversational marketing and sales platforms. 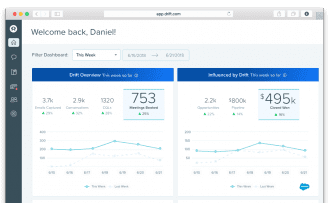 With drift, organizations can provide a completely modern buying experience, generate more leads, and convert those leads into completed sales. 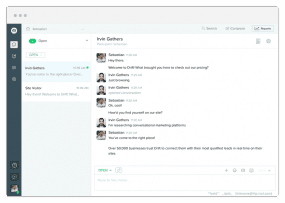 Drift considers themselves the “world’s first and only conversational marketing platform,” expanding beyond a simple live chat solution. The solution allows businesses to qualify their website visitors, enabling agents to focus on the truly meaningful conversations to provide support, and accelerate the overall sales cycle. Drift’s platform includes unique features like Agent profiles, an Operator chat bot, and much more. Whether your business is focusing on sales or marketing efforts, Drift’s platform will get the job done. Drift offers a truly unique platform that expands your organization’s capabilities way beyond simple live chat support. As an entire marketing or sales platform, Drift’s focus on conversations and direct interactions between prospects or customers and agents or representative’s enables your business shrink the overall sales process, and grow leads into closed deals. The personalized approach of a conversational based platform enables representatives to directly connect with leads and prospects, providing them with direct support for their issues, or answers for their inquiries. What helps Drift’s platform stand out is a number of unique features, one of which are the Drift profiles. Each agent, or representative, from your business is given their own Drift profile, which contains information including the rep’s name, picture, location, current time, position, and a little biography. These profiles enable users to reach out directly to what is obviously a live person, not just a generic chatbot. Users can also interact with the same Agent through profiles to ensure they receive the same level of service. Drift’s Operator Bot can also step in, enabling users to provide context about their inquiry prior to speaking to a representative. 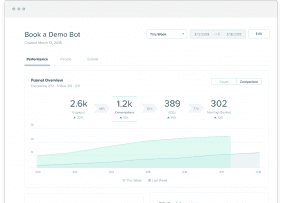 LeadBot can also be used to qualify leads directly on your website, without users having to fill out any forms — simply have a short conversation with the bot. 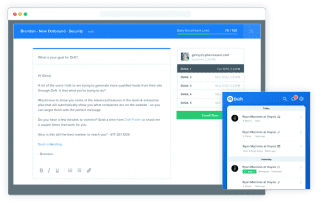 But if you want to reach out to someone not on your website, Drift enables your organization to send targeted and automated emails, which can directly convert into a live conversation with a representative. 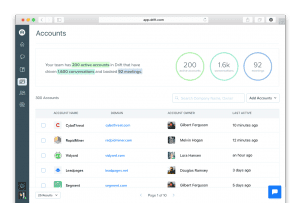 Overall, Drift’s platform provides businesses with the tools to revolutionize the way they foster new leads, close new deals, and support existing customers. With Drift, representatives can speak to more customers in less time, and provide a new layer of personalized service. This lightning quick response time combined with personalized support enables organizations to boost their sales, shorten the sales cycle, and overall provide the best service possible. What Do You Think of Drift?